I Want to See Your Machete. "I WANT TO SEE YOUR MACHETE"
It was a momentous occasion for me. There I was in San Antonio on Friday at two in the afternoon, and I was finally going to meet Ruthie Cade. 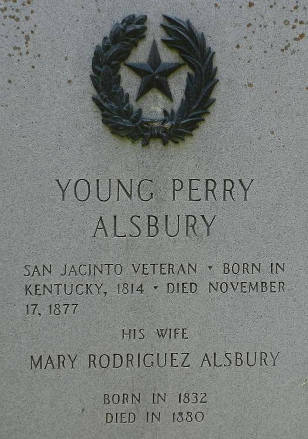 Literally minutes before, I had been able to find, after a previous failed attempt, the gray granite Centennial Marker placed at the grave of Perry Alsbury in a hidden, overgrown area within earshot of I-10. 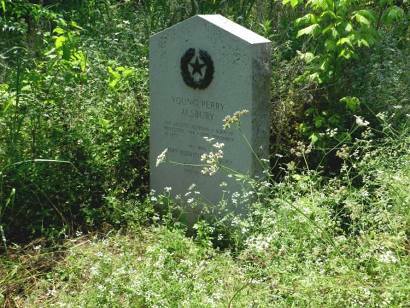 That marker for Alsbury was the 1,089th marker I have seen of the 1,136 placed way back in 1936 to memorialize the multi-year celebration of Texas' Independence from Mexico. Here I was, after having seen nearly 96% of that total, meeting the one person who made a lot of that search possible. Ruthie is the eighty-one year old (by her own admission) retired Army Lt Colonel whose notes of location and contact information on lost 1936 Gray Granite Centennial Historical Markers I had been using for more than three years. Without those notes for markers in more than 70 Texas counties, I would have had to spend countless hours on the internet and phone, and would have driven many miles making many U-Turns down dusty county roads. As I have said to others about getting to some of these remote markers, "Just because Ruthie Cade saw it doesn't mean I can do it, too." In 1936 the placement of these 1,136 museums, fort restorations, statues, monuments as well as these granite markers, placed in nearly every one of the 254 counties of Texas, may have made a lot of sense, but with the passage of all this time, roads have changed or closed, subdivisions and interstate highways have been built, and floods have eroded cemeteries. 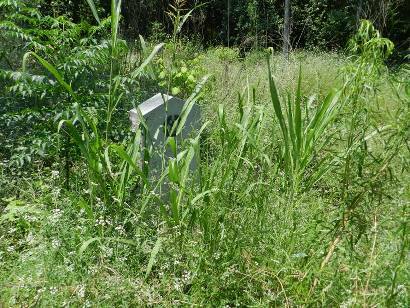 Many markers have been moved or are now well secluded from civilization deep inside private property. Over the years, the scant location information of a great many of these markers have been lost or misplaced. After getting directions to her house from the security guard in her gated retirement community, I had finally arrived for the meeting. The first woman who came out of the house was who I call, The Face of Centennial Markers, Charlotte Phillips. She is Ruthie's close friend who traveled with Ruthie and often stood by the marker as Ruthie took the photo. I felt that I knew Charlotte but I wouldn't have been able to pick Ruthie out of a police lineup. When Ruthie did come out, I don't think she shook my hand or even made a greeting. The first thing she said was, "I want to see your machete." It was like only the real Barclay Gibson would have such a weapon. I happened to have mentioned to Ruthie in one of our infrequent emails that I carried a machete as it is sometimes necessary to hack my way to some long forgotten, over grown, neglected cemetery to see some even longer neglected Centennial Grave Marker placed there over 75 years ago in memory of an individual who played an important part in Texas History. She wasn't kidding. I had to open my tool box and actually pull it out of its scabbard to satisfy her that I really was who I said I was. That opened the door for the next three hours of a conversation almost exclusively devoted to our various visits to Centennial Historical Markers located all over the state. At this point, let me say that it is not particularly easy to strike up a casual conversation on a series of events occurring back in the 1930s, even if it is a subject so dear to the heart of most Texans as the Centennial Celebration of Texas independence from Mexico. We shared stories of cuts from thorn bushes, keys lost when crawling under fences, land owners reluctant to let us on their property, bee stings from swarms in collapsing houses, rattlesnakes guarding markers, photos of markers taken by the light of headlights, rocky hiking trails taken because a four wheel drive vehicle was needed to go any further, even of one land owner who knocked the marker over and covered it with dirt, and, of course, of seeing a marker only after hacking a path to a cemetery. There is one story in particular that Ruthie enjoys telling. It was about a remote marker that she really wanted to see. 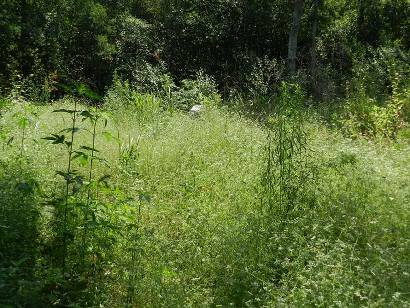 The land owner told her about where to find it and then added, �Be sure to watch out for the feral pigs.� Not knowing much about feral pigs, she asked, �Are they dangerous.� He responded that they had not killed anyone, yet. She kept that word, yet, in mind as she searched for the marker. Thankfully, the pigs were off somewhere else when I saw that same marker several years later. Of course, Charlotte was a part of our conversation because Ruthie rarely took a photo without some subject next to it. Her subjects included Park Rangers, cousins, nieces and nephews, ranchers, land owners and caretakers, but most often that person was Charlotte. Most conversations have side tracks where you start telling one story and that reminds you of something else and before long the original tale is forgotten. Not with Ruthie. It must be her military training and a natural instinct to follow something to its intended conclusion. On several occasions she would say something like, "You mentioned monuments, we'll come back to that later." We always did. I can't think of a single rabbit-track that we didn't come back to and get to the conclusion. Probably the only other person who could have kept up with those three hours of tales and counter-tales would have been Sarah Reveley. Working as a volunteer directly with the Texas Historical Commission, Sarah has been the stimulus behind locating and photographing these markers. She sent me Ruthie's notes and put me in touch with Ruthie in the first place. She, too, lives in San Antonio and had some kind of meeting going on until about 5 o'clock. After Sarah's meeting was over, we all met at a popular local Mexican food restaurant to wrap up all the stories we could cram into our all too short a gathering of marker aficionados. 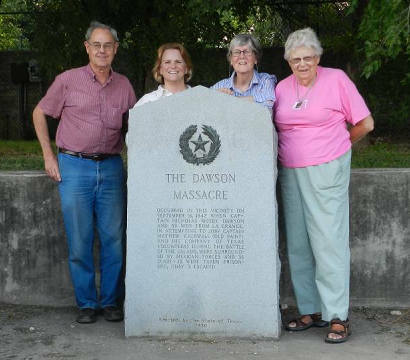 After the delicious meal, the four of us gathered at a nearby Centennial marker for a once in a lifetime chance to take a group photo next to one of these unnoticed markers on a busy San Antonio highway. Probably not one person in a thousand has even looked at it as they drove right by the marker commuting to and from work every day. After the photo was taken, we each went our separate way relishing the time spent with others who share a rather esoteric interest in bringing these 76 year old markers back to life, if even just for our own satisfaction of knowing where, when and why they were erected in the first place. I had much to think about on my nearly 500 miles back home in Carlsbad, New Mexico... Wait just a minute, New Mexico?? You wrote all that and now you say you are not even a native born Texan but are from the state of ... New Mexico? Why in the world would someone from New Mexico have this interest in Texas history? 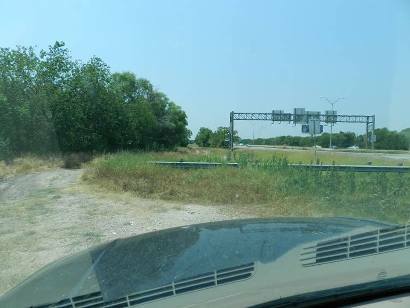 Why would a �foreigner� coordinate with three other volunteers to drive all over our great state of Texas trying to find these markers? All I can say is that from the beginning, I�ve been trying to figure that out myself, over 120,000 miles ago.